See the world in a whole new light with these home-made Infrared Goggles! Amazing images! See the Test Results in the video at the end of this Instructable. Thanks to Bill Beaty for the idea. First pick up a pair of welding Goggles. I got these online for $7. The second lighting gel is "Primary Red". The LEE number is 106 and the Rosco number is 27. Unscrew the lens assembly for each eyepiece and remove the green welding gel, leaving only the clear gel. This will reinforce the blue and red gels you will be installing. Using the welding gel as a template, cut out 8 blue gels and 2 red gels. Take 4 blue gels and insert them in the eyepiece assemblies and then screw them back on to your new IR-Goggles. Now, wait for a very bright sunny day and go outside! You won't believe what you see. DO NOT LOOK AT THE SUN!! Serious, permanent eye damage can occur in seconds. Then for another effect, add the red gel to each eyepiece and see the difference. Now here is the video! Does anyone here know or have an idea as to what the Nometer (NM) value these goggles have when put together like this? 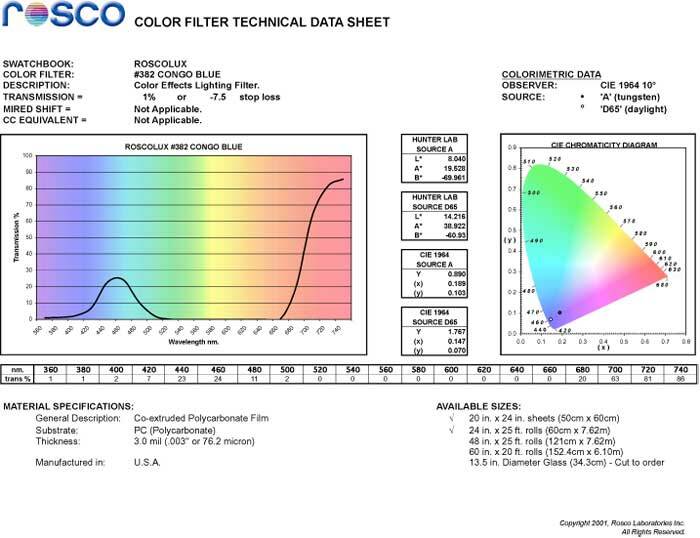 Rosco has datasheets with transmittance at wavelengths. Will these work as night vision goggles if I use an Infra-red flashlight? Human eyes are generally considered to not be sensitive to the Infra-Red at all, so it's curious that one would be able to see much by blocking out almost all visible light (checking the suggested filters on rosco.com, they would indeed block most visible light). Either there is just enough leakage for one's eyes to respond producing weird colors, or if the human retina is in fact sensitive to any IR at all one would expect it to look like either red (tail end of the red receptors) or green (a paper in Nature recently suggested that 1050nm light can be converted to green ~500nm light in the green receptors). Cool idea either way - using the rosco filters to produce custom filtering is smart! The human eye can actually detect all spectrums. Our ears are not any different. Our brains do a lot of filtering, however, so this tricks the brain into not filtering it out. It's a common misconception that there's a border between "visible" and "IR" wavelengths. There is no such border. 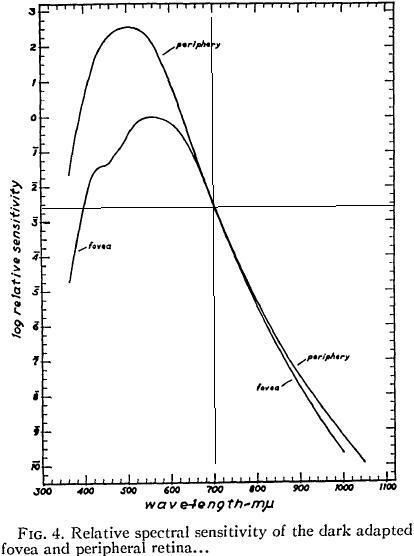 See the human visual sensitivity curve http://amasci.com/graphics/IRcurve_HVS.jpg , semi-log graph. Our eyes' longwave filter-function is smooth rolloff from 600nM to 1000nM. Also, if you work with lasers you'll known that humans easily see bright laser light at 800nM, 900nM, 1000 nanometers. Go get your TV remote and look into the LEDs in a dark room: you'll see 800 or 900nM light as dim red flashing. But all this applies to intensely bright single-frequency light, which is a fairly non-natural situation. These goggles block visible light, so if you're in an environment with lots of IR illumination, you'll see the "infrared world." One layer of Lee congo-blue filter, combined with the HVS (human visual sensitivity) graph, gives this graph: http://amasci.com/graphics/leefltr4.gif Add more layers of congo blue, and the peak moves farther out past 700nM, but becomes smaller. I made a pair of these over a decade ago. I went to Harbor Freight and Barbizon in order to get the necessary materials. The goggles are pretty cool. In the Pacific Theatre during WWII, sometimes when there was a camouflaged Japanese sniper in a tree halting the American advance, a counter sniper would be called up to the front who could pick the sniper out of the tree by looking at his infrared heat signature. In the 1970s, I opened my eyes during samadhi and I saw the energy field around an extension cord that was plugged into the wall. does anyone know of a reasonable reliable source for these items? > firefighters to locate "hot spots"
You'll need a thermal imager, or "thermal infrared" camera. Those aren't like normal video cams, instead they require expensive germanium or silicon lenses, and the camera's sensor is a "bolometer array" rather than a light detector. I can't get my hands on gels can anyone suggest any other way to take care of this problem ? could you make these into night vision by putting a infrared led into, lets say, a maglite w/ led conversion and use both together? just saying because the flashlight would put off infrared and goggles would pick that up right? Exactly, and that's part of my original project: using Congo Blue filters to convert an incandescent floodlamp into an "IR vision" generator in a darkened room. This doesn't work nearly as well as welding goggles and sunlight. Even so, it's really odd to see black clothing turn red-grey, and human eyes turn huge, black, and alien. not necessarily - IR is a HUGE range of wavelengths, without more detailed names because, well, we can't see them so they're all just called "infrared". But long-wave infrared (LIR) is mostly emitted by heated objects, and that's way further from typical "red" than near-infra-red, which includes wavelengths of light just beyond typical "red" (650nm). Reflected IR and emitted thermal energy are not the same thing. Not really. Sunlight is thermal radiation. Any object as hot as the Sun would glow the same colour as sunlight. The light from an incandescent light bulb is the thermal radiation from its hot filament. The light of a fire is its thermal radiation; if you look at a candle flame, the blue part is energy emitted directly by the chemical reaction, but the yellow part is the thermal radiation from the hot gases it emits. Any object at the temperature of a human body does indeed radiate infrared light, but it's far too dim for a human eye to see. With or without these goggles, you can't see the thermal radiation of anything unless it's well over 400 degrees Celsius (750 degrees Fahrenheit). The IR emitted by the human body is too dim to see with the human eye. These goggles only let you see very very bright IR, like the IR in sunlight. Bill is absolutely correct that by heavily suppressing the so called visible spectrum from ~400 to ~750 nm the normally "swamped" NIR sensitivity of the eyes is allowed to come into play. As there is more IR coming from the Sun than visible light this effect is very strong in sunlight. It is easy to prove that the eyes are actually recieving NIR when wearing the filters Bill pioneered. Typical organic fabric dyes are NIR transparent so if you look at most dark fabrics when wearing the filters the fabrics will appear light coloured. I have written my name on on my black camera case with a black Sharpie felt tip pen and it is virtually invisible to the unaided eye. Yet it appears perfectly clearly when wearing IR passband filters in sunlight or under a stong incandescent light. This is because Sharpie pens (and perhaps other pens) contain a NIR opaque dye(s) wheras the black dye in the nylon camera bag is NIR transparent. This phenomena could only occur if the NIR sensitivity of the eyes was a fact. In fact recent work has shown that a large percentage of the population even have a higher sensitivity than previously thought at the other end of the spectrum; the UV.